With the competition heating up between top destinations, tourism organizations are looking for cost-effective means to engage visitors. 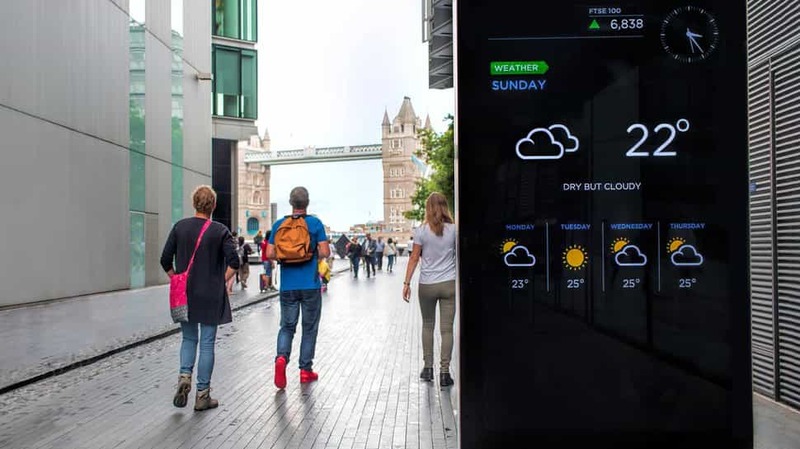 Digital signage for tourism engages travelers, encouraging them to explore popular hot spots while keeping them connected to current news, exchange rates and providing local information. Using interactive touch-enabled menus and high impact multimedia, visitors can discover where to go and what to see in a lively manner. Deploying wayfinding kiosks can provide valuable assistance to the first time tourist. By incorporating smart maps with street views you can provide visitors an entertaining way to learn about featured destinations and how to get from here to there. When done smartly, wayfinding can point out other, lesser known destinations along the way. Smart benches provide convenient places for tourists to sit down, recharge their mobile phone and access the Internet via local WiFi. There is a natural synergy between smart benches and digital signage. Why not display timely entertainment and useful information to visitors lounging about while charging their phone or sending an email home. Digital signage for tourism provides a very cost-effective advertising platform that can effectively target travelers. It can be used to promote local business. Digital signage based advertising provides an important revenue source and can be used to support the deployment and operating cost of your digital islands. For most small to mid-sized tourist organizations there is very little IT staff support available. So when considering using digital signage for tourism care must be given to cost, IT burden and ease-of-use. When evaluating a digital signage solution there is certainly the one-time equipment costs to consider. But there will also be an ongoing cost for creating and updating your digital signage content. And over time digital signage content creation costs can become substantial, even eclipsing your digital signage hardware costs. This is especially true when using graphic designers to create your content. For this reason we recommend using a digital signage solution based on Microsoft® PowerPoint®. By using PowerPoint, in-house staff is more than able to produce and update tourist and other timely information displayed on your digital signs. We offer an affordable digital signage solution called PowerSignage™. PowerSignage is a cloud-based service that uses PowerPoint for signage content creation and low cost PC sticks for digital signage TV display. PC sticks (also called compute sticks) are pocket-sized Windows devices that plug into your TV’s HDMI input, and are capable of displaying digital signage in full HD. You can purchase Windows-based PC or compute sticks from stores and online retailers like Amazon from between $89.95 and $149.95. With PowerSignage simply plug in your PC or compute stick into your TV and upload your PowerPoint signage presentation to our cloud service. PC/compute sticks running our software automatically download and display your PowerPoint signage presentations on your TV points. And most importantly for the tourist market, PowerSignage supports digital signage display at multiple locations. PowerSignage is an outsourced service: we take care of all the IT headaches for you. To create and manage digital signage you only need to know how to use PowerPoint and a web browser. Our aim is to reduce your IT burden for using digital signage to zero. What could be more simple? Please visit https://www.powerdigitalsignage.com for more information about PowerSignage. Microsoft and PowerPoint are the registered trademarks of Microsoft Corporation. PowerSignage is the trademark of Power Media Design Pty Ltd. I hired graphic/web designer to put it together for me.